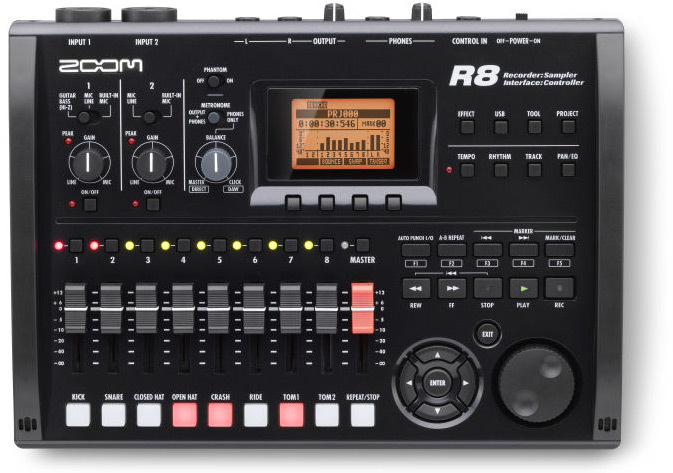 Zoom's R8 is an ultra-portable audio production solution that combines four production tools in one versatile device. 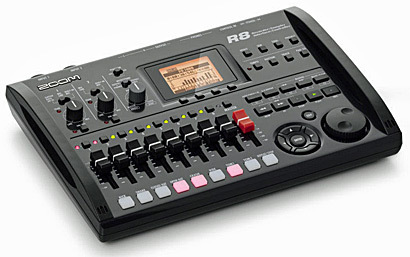 In addition to being a richly featured multitrack-style 8-track recorder using SD (SDHC) memory cards, the R8 is also an audio interface, a control surface and a sound sampler. With the ability to record two tracks simultaneously, the R8 is perfect for capturing audio on-the-go. Record live performances, rehearsals, song writing sessions or even audio for film and video. 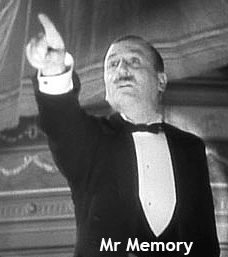 Capture your audio at up to 24-bit/48kHz resolution as WAV files. On each of its side panels, the R8 features a built-in stereo condenser microphone for field recording or quick, convenient “sketch-pad” ideas. When you're ready to mix your tracks down, you can use over 140 built-in studio effects to enhance your tracks and the R8's professional mastering effects to help you deliver the most polished production. THIS RECORDER COMES WITH A 2Gb SD CARD TO GET YOU STARTED, BUT YOU MAY NEED LARGER CAPACITY MEDIA THAN THIS - PLEASE SEE OUR APPROVED SD CARDS BELOW.